Can a Training Needs Assessment Create the Learning Win You're Looking For? Who will be the key players? What strategic plays does each team’s coach have lined up? How will the quarterback fair? While your next training initiative won’t have the world’s eyes watching, it likely has the attention of senior leadership and managers and is no different than a football game when you consider the logistics. You have to bridge a skills gap and require the right training and team behind you in order to get to the end zone, in this case successfully through your training event. 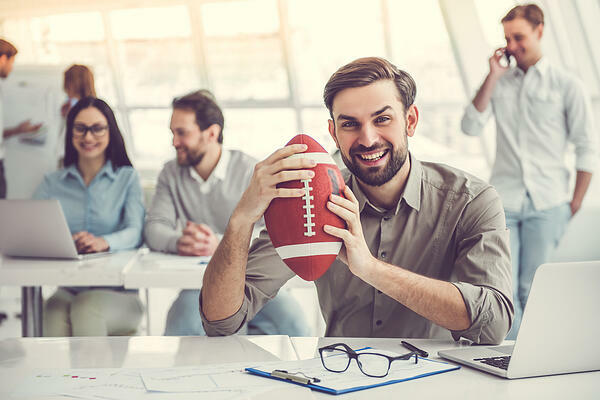 As the quarterback of the team, it’s your job to lead your team to a victory when it comes to meeting training and development goals and objectives set by your training initiatives and this means that you’ll also need a trusty handbook filled with strategy. That’s where a Training Needs Assessment comes into play. Unfortunately, it is also something that many Learning Leaders continue to ignore before heading out to create a training program. There are many reasons that the training misses the mark. 1. Inadequate information to truly bridge the knowledge skills and abilities gap is provided to learners. 2. The training is delivered in a less than optimal way based on the learning style of the affected employees. The training does not address the true issue that the training was meant to solve and instead 3. focuses on a symptom of the underlying problem. Basically, the initiative fails to score, resulting in loss of budget, morale, time and resources which could have all been avoided! Why then do companies continue to forge ahead blindly, introducing training programs left right and centre? For one, they’re already being stretched too thin leaving little to no time to invest in putting together a strong training needs analysis. Another reason is company culture, where the leadership team may be looking for immediate action versus allocating the time that is required to create a Training Needs Assessment before starting on the planning of a program. A third reason that we see here at TrainingFolks with clients that come on board is resource shortages combined with a lack of experience or knowledge when it comes to completing a comprehensive report on the development needs of the organization. Being the coach doesn’t mean carrying the ball to the end zone! It means bringing together a strong team that can and coaching them with the right strategy to win. Download our free Training Needs Assessment (TNA) guide and editable checklist today entitled: 10 Questions to Answer for TNA Success. It will aid with identifying the key areas of consideration when drafting your next training needs assessment process leading to more effective training. As a working document, it also allows you to save, edit and share the information with your team. Recruiting the right team can also be a challenge-so why not draft the experts? Contact the team at TrainingFolks today and we’ll have one of our Senior Account Managers work with you to ensure that you’re on your way to establishing the right process for upcoming Training Needs Assessments as well as assist with creating a methodical document using our proven process to help ensure that your next training initiative is a winner.